Below is all the news out of the pNEURO lab from 2016. Congratulations to Ahmad Jiman, who officially became a BME PhD candidate after completing all requirements for his Qualifying Exam! 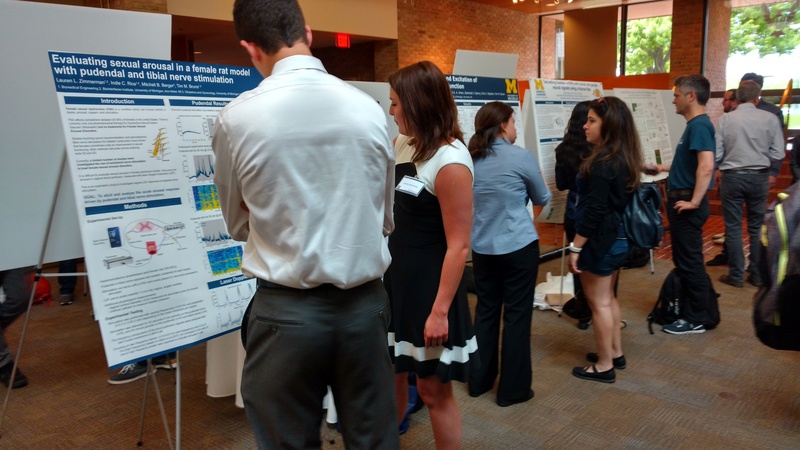 We had a busy Society for Neuroscience conference, with seven lab posters! Shani Ross, Ahmad Jiman, Lauren Zimmerman, Aileen Ouyang, and Indie Rice all had a poster, and Zach Sperry had two posters. It was a fun time in San Diego. We became a fashionable lab, getting lab t-shirts! This was in celebration of our lab’s first publication. Congratulations to Zach Sperry, who officially became a BME PhD candidate after completing all requirements for his Qualifying Exam! 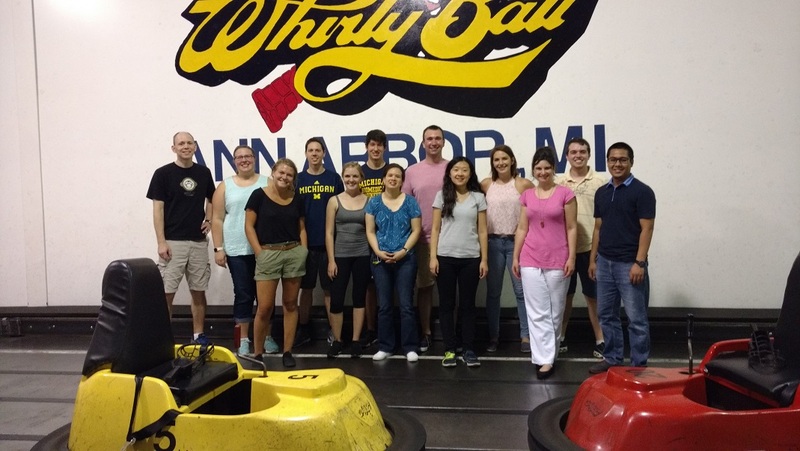 We had a fun lab event, playing whirlyball. 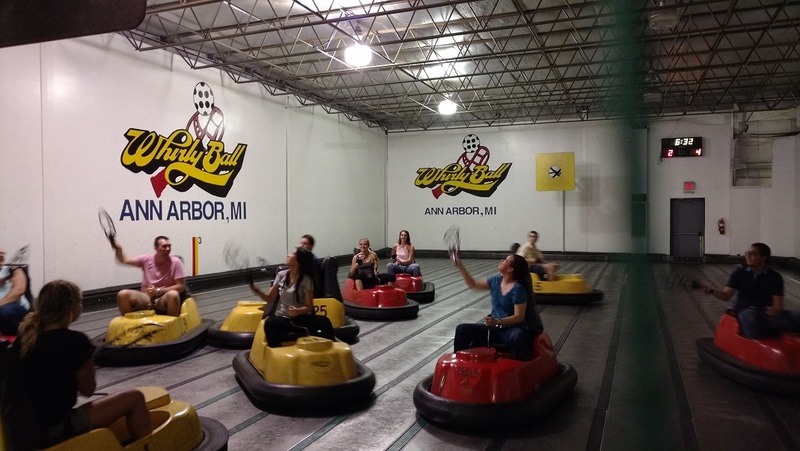 What is whirlyball? A combination of bumper cars, jai-alai, and basketball! 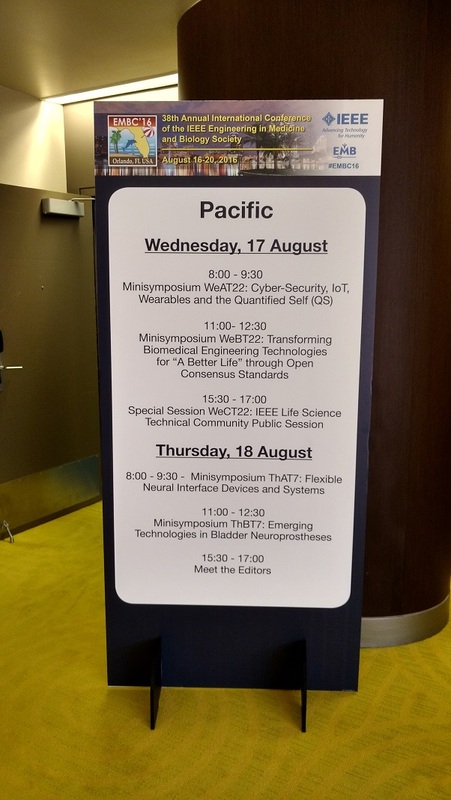 Dr. Bruns was a co-chair of a minisymposium on Emerging Technologies in Bladder Neuroprostheses at the IEEE EMBC meeting in Orlando. It was a great session, with talks from leaders in the field. 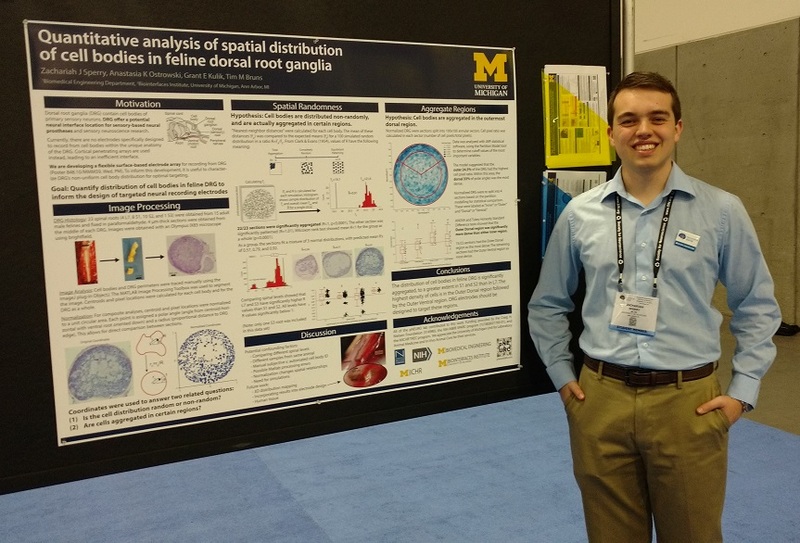 Congrats to Zach Ricca in wrapping up his SROP experience in the lab with an excellent poster session. We were very excited to have our first lab paper accepted, at BMC Neuroscience, with Shani Ross, Zach Sperry, Colin Mahar, and Dr. Bruns as authors. Shani Ross and Lauren Zimmerman were both awarded Diversity Travel Awards to attend the upcoming NANS2-NIC meeting in Baltimore. 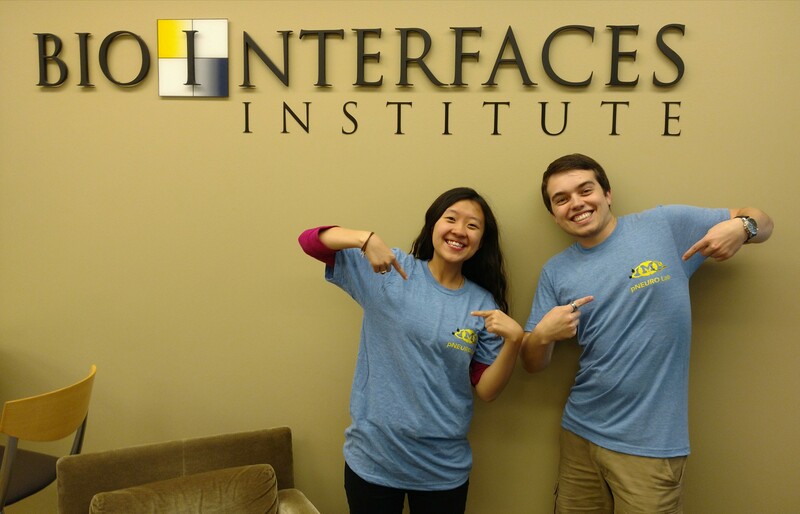 In addition to Shani and Lauren, Aileen Ouyang and Zach Sperry will also be presenting posters. 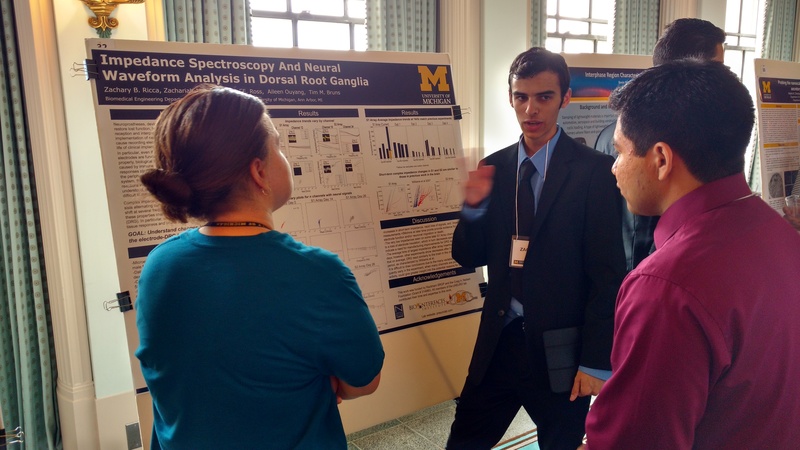 For June 13th and 14th we had four posters at the NSF-supported International Conference for Advanced Neurotechnology, held at the University of Michigan. At this posting, they have all of the talks archived on video, which came from a stellar group of well-known researchers. 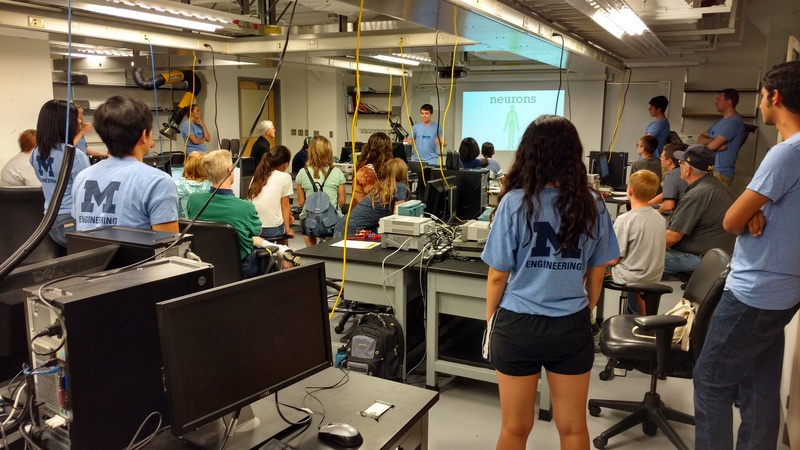 On June 23rd and 24th Zach Sperry led a College of Engineering Xplore Engineering Summer Camp workshop for kids of alumni. Many in the lab also helped out, in addition to other students in the neural engineering community, and we had a lot of fun. Our sessionused Backyard Brains kits to teach kids about talking to nerves. Here are links to the official flickr photo streams from Thursday (first, second, third sessions) and Friday (first, second, third sessions). 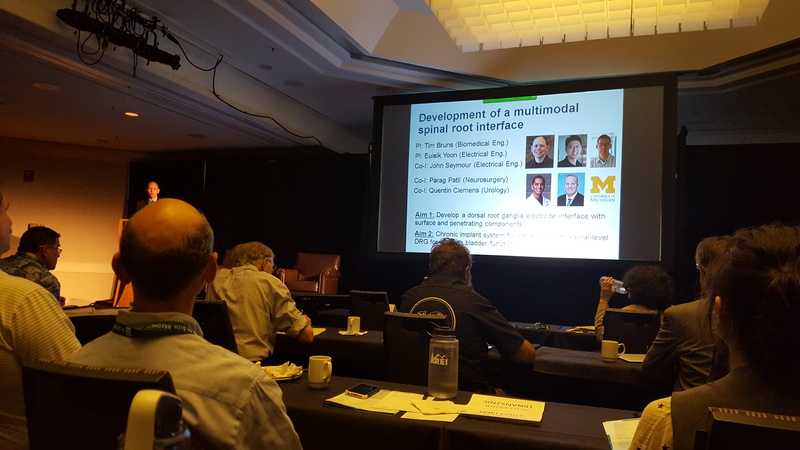 At the end of June we attended the joint North America Neuromodulation Society – Neural Interfaces Conference in Baltimore, Maryland. 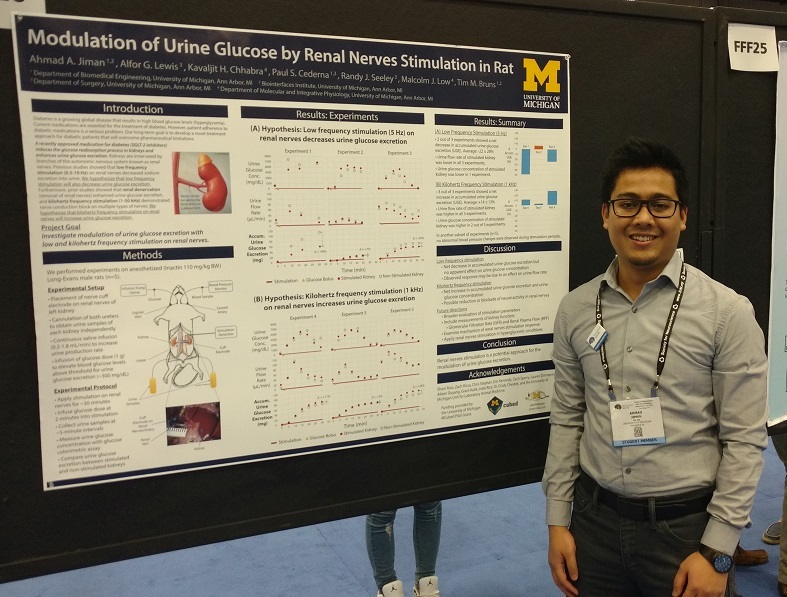 Dr. Bruns gave a couple of short talks on one day and Shani Ross, Lauren Zimmerman, Aileen Ouyang, and Zach Sperry all had busy poster presentations. Anastasia Ostrowski was awarded a Whitaker International Fellowship. She intends to start in June, 2017, working in Switzerland. Awesome! 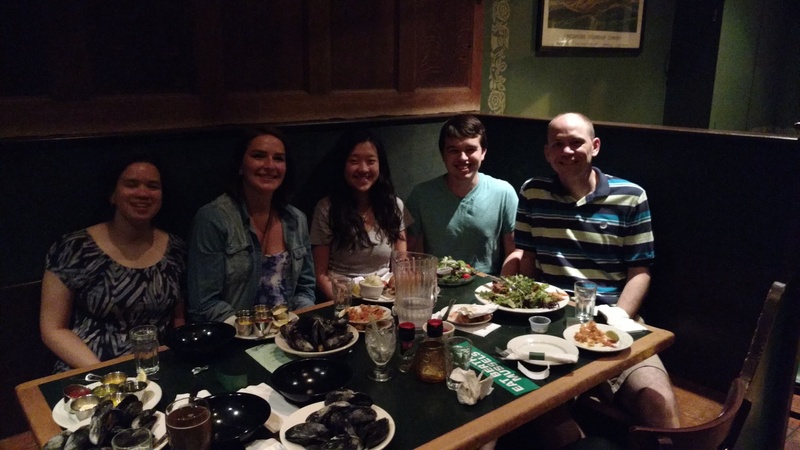 Aileen Ouyang was awarded a Rackham Summer Award to support her research in our lab. Congrats! Colin Mahar has excelled in his “other” life while a student: as a varsity athlete on the Men’s Gymnastics team performing Still Rings. After finishing fourth at the Big Ten Championships, Colin excelled at the National Championships, finishing third to garner All-American status. Wow! Zach Sperry also has kept busy outside the lab and classroom, and was part of the Life Sciences Orchestra at the university. Their second play of the year was excellent! Aileen Ouyang and Zach Sperry received a Rackham Graduate Student Grant. And congratulations to Colin Mahar, Anastasia Ostrowski, and Christ Stephan for graduating with their B.S. degrees and to Zach Sperry for receiving his M.S. degree! Ahmad Jiman received a Rackham Graduate Student Grant. 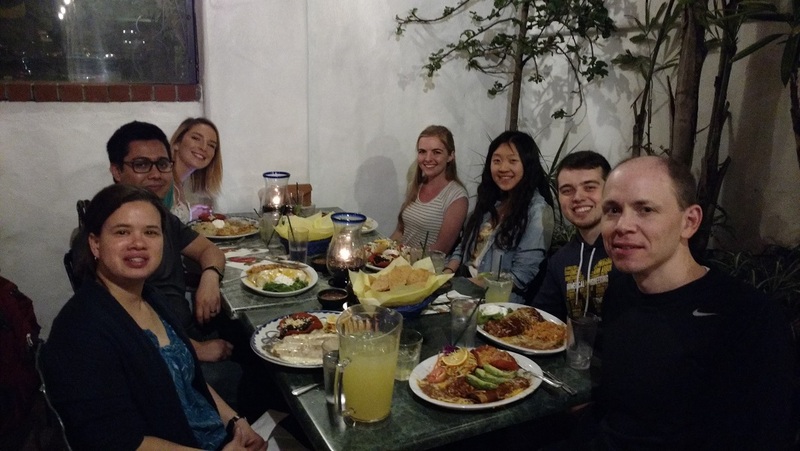 Indie Rice was accepted as a scholar in the NSF-supported International Program for the Advancement of Neurotechnology (IPAN), to do research in Germany for the upcoming summer. 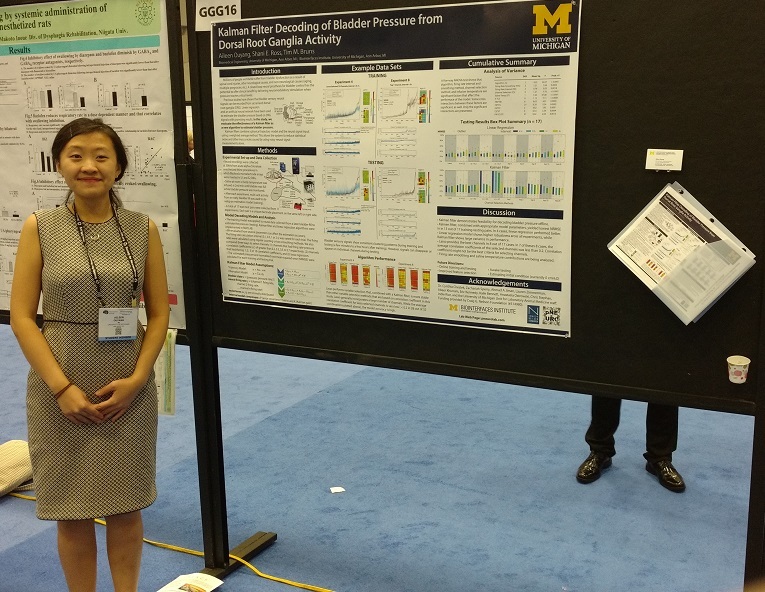 Aileen Ouyang was accepted into the University of Michigan BME PhD program. Colin Mahar was accepted into the University of Texas at Dallas PhD program. 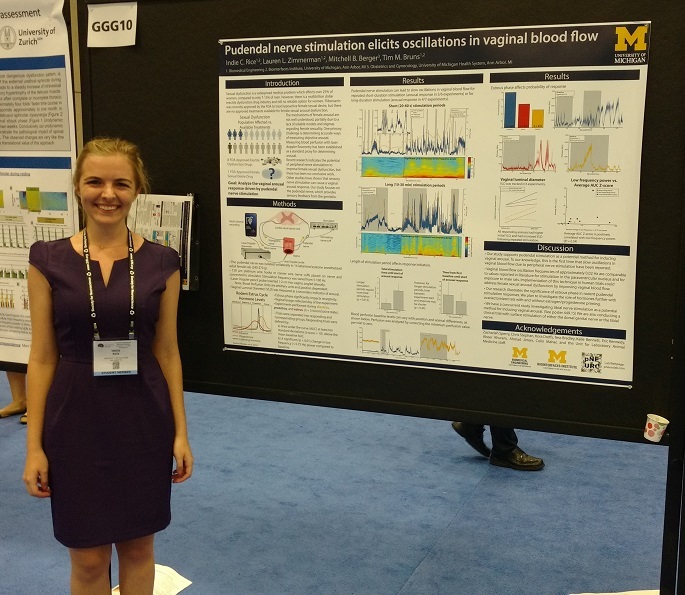 Anastasia Ostrowski was featured in a University of Michigan article on Wolverine Women to Watch in 2016 for her entrepreneurial activities. At the BME Career Day, Indie Rice was recognized for the Best Overall poster presentation and Anastasia Ostrowski was recognized for the Best Research Poster presentation.